We are honored to remember the many brave men and women who have given their lives throughout the history of our great nation – those who made the ultimate sacrifice to protect us from harm. 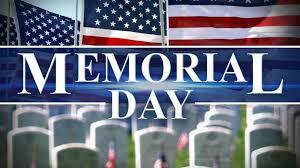 We salute all those now serving and we raise prayers for their safety and blessing. Heavenly Father, As we remember those who have made the ultimate sacrifice for the freedoms we enjoy every day, we think of how they have followed in the footsteps of your son, our Savior, Jesus Christ. Please hold our servicemen and women in your strong arms. Cover them with your sheltering grace and your presence as they stand in the gap for our protection. We also remember the families of our troops. We ask for your unique blessings to fill their homes, and we pray your peace, provision, and strength will fill their lives. May the members of our armed forces be supplied with courage to face each day and may they trust in the Lord's mighty power to accomplish each task. Let our military brothers and sisters feel our love and support. In the name of Jesus. Amen.